Prolonged drought is one of the hallmarks of a warming climate. Texas has been in the grips of widespread drought since late 2010; California, where my daughters used to live, is in its third year of drought, with 100 percent of the state experiencing “severe” to “exceptional” drought conditions. Hillsides are a dull brown instead of vibrant summer green. One of the reasons drought hurts us so badly is that we waste a lot of water—not just by taking epic showers and being obsessed with grassy lawns, but by relying on outdated, inefficient water management systems that are built to move water away rather than keep it where it’s needed. Saving water helps towns and cities protect against drought. It can also help save you time and money. I love that I can claim water conservation as an excuse to avoid hand-washing dishes or the car. And that I can take advantage of all the rebates and incentives offered by many utilities for water-efficient upgrades like water-smart shower heads, or even landscaping with drought-tolerant plants. Expanding conservation and efficiency programs, according to a recent report by NRDC, can reduce water use in cities by one-third or even one-half. Here are seven easy ways to stop wasting water this summer. You’ll reduce your water bill, save yourself some time, and help reduce pollution, too. 1. Water your yard in the morning or evening. Water evaporates quickly when the sun is high, so sprinkle when it’s more likely to stay in the soil. And make sure you’re watering your yard, not the sidewalk or driveway. A drip irrigation system works better than sprinklers, as it sends targeted amounts of water exactly where you want it. Check to see if you qualify for a rebate to make your irrigation system more water efficient. 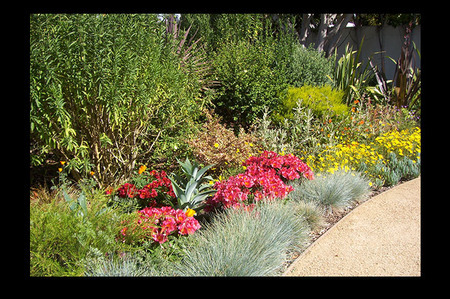 Upgrade: Remove your thirsty turf grass and replace it with a beautiful drought-tolerant garden that doesn’t need precious drinking water, or mowing. You’ll save money on your water bill--your water supplier might even pay you for every square foot of grass you remove. 2. Check for leaks with the toilet test. Put a few drops of food coloring or a dye tablet into your toilet tank. If the color shows up in the bowl, your tank is leaking, silently wasting up to 100 gallons of water a day. I tried this myself, and sure enough, found a leak. An inexpensive rubber flapper may be all you need to fix it; just be sure the replacement flapper is made to fit your toilet’s make and model. 3. Shorten your shower. Trimming just two minutes off your shower can save up to 1,750 gallons of water per person in your household each year. Another easy trick is to turn the water off while you soap and/or shave. You can also capture the water that’s normally wasted while you wait for the shower to warm up by collecting it in a bucket—use it for watering plants. If you plan to re-use soapy water in your garden, make sure your soap is safe for plants. Upgrade: Install water-efficient shower heads, toilets, faucets, or an Energy Star washing machine to eliminate thousands of gallons of water waste each year. You might even qualify for a rebate. 4. Use the dishwasher. Hand-washing your dishes can use up to 27 gallons of water, compared to just 3 gallons for a new Energy Star-rated dishwasher. 5. Cover the pool. If you’re fortunate enough to have a backyard pool, make sure the water stays in it instead of evaporating—cover your pool when you’re not using it, even in the summer. 6. Go to the car wash. Washing a car at home can easily use 100 gallons of water, not to mention an awful lot of time and effort; commercial car washes often use only 40 gallons or less of fresh water. 7. Get a rain barrel. Collect the water that streams off your roof when it rains by setting up a rain barrel underneath your gutter’s downspout. Reuse that water in your garden instead of letting it push motor oil, pet waste and garbage from the streets into local rivers. Upgrade: Rain barrels are just one of several smart strategies that catch or soak up rain water where it falls. Green roofs, porous pavement, rain gardens, and other water-saving techniques are called green infrastructure. More cities and property owners are choosing to invest in these strategies as a way to save water, reduce pollution, and save millions or billions of dollars over the cost of building new tanks, tunnels, and traditional water infrastructure.